Mother nature's favorite stakes. Finally a reliable staking option. Utilizing a new technology invented in Europe, Ecoduty stakes break down and biodegrade in 24-36 months. Steel staples are unsafe since they rust, have limited holding power to keep them in the ground, and can cause significant harm or injury. 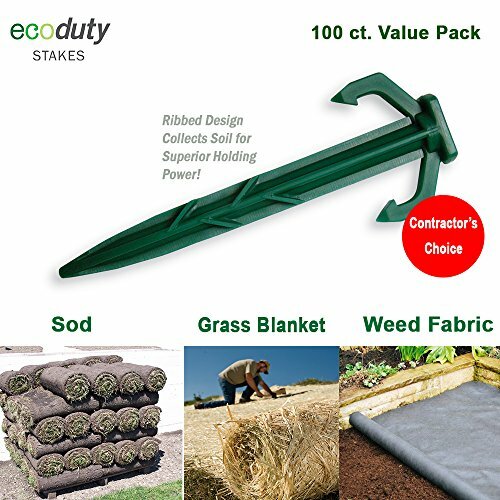 Ecoduty stakes have significantly more holding power due to the ribbed design, which collect soil. Great option for parks, schools or residential jobs where safety of the jobsite is a concern. Safer than metal. If you have any questions about this product by Ecoduty, contact us by completing and submitting the form below. If you are looking for a specif part number, please include it with your message.